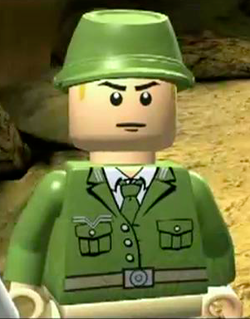 Colonel Dietrich is a LEGO Indiana Jones: The Original Adventures minifigure introduced in 2008. He uses a pistol as his primary weapon. In LEGO Indiana Jones 2: The Adventure Continues, he is put under the Ark of the Covenant's spell and dances to a disco ball, but he avoided death by hiding inside the trash bin. In LEGO Indiana Jones 2: The Adventure Continues, he wields a bazooka as his primary weapon.